Graphic a la Design - Understanding colour is imperative for business. Understanding colour is imperative for business. Understanding colour is imperative for your business branding and marketing. Anyone who has worked with me before knows that I have always appreciated psychology of, well, anything in the world of design. Fonts, images, graphics, photography, colour and everything between — you name it and I’m into understanding it! Human behaviour has always fascinated and inspired me and this definitely translates over to my designs. If you look at my work while keeping human behaviour in mind, you will soon notice everything on the page has purpose. Everything lines up with something; fonts are readable and legible according to their purpose, graphics are involved, etc. Colour, and all of its meanings, play a very, very important part as well. So, let’s try an exercise together! Quick: What’s the first colour that comes to mind when you read the following words? Tiffany’s. Home Depot. Canadian Tire. Facebook. What colours did you think? My best guess would be: Teal. Orange. Red. Blue. Each year, business spends billions of dollars on branding and re-branding and colour plays an important role in the decision making process. While you wouldn’t think it, the colour a company uses to brand itself conveys many messages to their customers. Colours can convey how trustworthy, reliable, and dependable a company wishes to be. They can even convey the quality of their products! I know what you’re thinking; this couldn’t possibly be true. But there is truth to it! A Canadian study conducted by Satydndra Singh, Department of Administrative Studies University of Winnipeg, called the Impact of Colour in Marketing demonstrates just how important colour in marketing and how it affects us as consumers. The study surveyed individuals by having them make a decision about a product or person with 90 seconds if the initial interaction. 90% of individuals surveyed made a snap judgment about a product based on colour alone. With these facts in mind, businesses work hard to ensure that their branding correctly conveys the message they want to get across and in a way that will make consumers pick them every time. They do this by firstly understanding their brand personality and selecting a complimentary colour from there. Brand personality can be divided into five core areas: sincerity; excitement; competence; sophistication; and ruggedness. 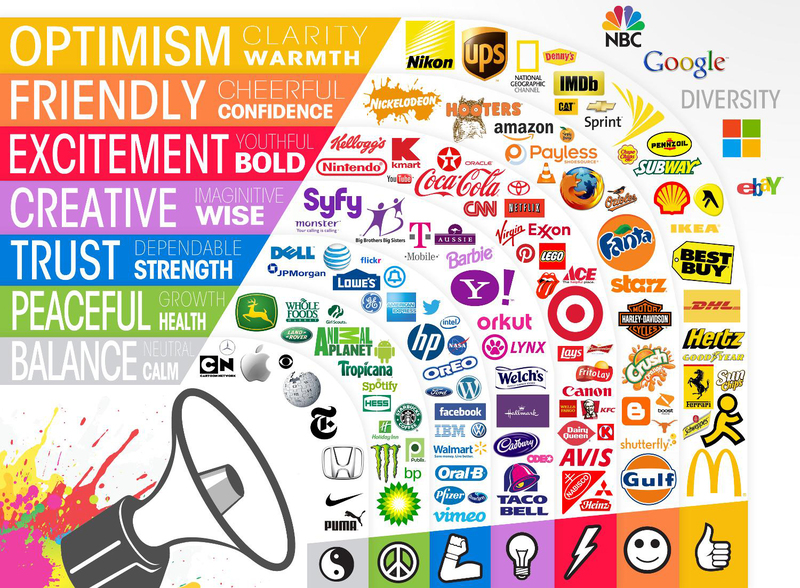 Within those core areas, brands are known to have personalities. From there, the colour must fit in with the brand’s personality as there is also a connection with colours and brand retention. Specific colours connect with people’s personality or gender. It’s not hard to understand why yellow is psychologically the happiest and most stimulating colour in the spectrum, but what about the rest of the colours? Yellow is a warm and happy colour. In business, yellow stimulates the logical side of the brain for mental clarity. Consumers feel: joyous, alive, energetic, and fresh. However, yellow also has negative meanings: overly analytical, impatient, impulsive, egotistical, pessimistic, spiteful, cowardly, deceitful, non-emotional and lacking compassion. Orange is a physical colour. In business, you must use it cautiously as it is considered the most disliked colour worldwide. Consumers feel: enthusiastic, creative, determined and stimulated. It also has the following negative meanings: superficial, insincere, dependent, pessimistic, cheap, overly confident and unsociable. Orange is a great colour for impulsive shoppers, buy-sell-subscribe users, friendly, confident and cheerful users. Red is a physical colour. In business it will always elicit a passionate response. Consumers feel: loving, sweet, warm, sensual and nurtured. Also consider these negative meanings: violent, resentful, rebellious, overbearing, aggressive, angry, tiring, fearful and quick-tempered. Red is a great for increasing the heart rate, restaurants that want to stimulate appetite, clearance sales and impulsive shoppers. Purple suggests wealth, extravagance, fantasy and dreams. In business it heightens consumers sense of beauty and their reactions to creative ideas. Consumers feel: glamorous, powerful, nostalgic, romantic and introspective. Like all colours, it comes with it’s negative meanings: impractical, cynical, aloof, and arrogant. Purple is a great colour for anti-aging products, to soothe or calm, or for representing creative and imaginative wise brands. Blue suggests confidence, reliably and responsibility. In business blue is calming and reduces tension or fear. Consumers feel: comforted, faithful, conservative, understanding, clarity, confident, calm and trusting. Blue is best used for corporate companies where trust and dependability is a must. Hi-tech computer technology businesses can benefit from blue the most. Green suggests balance and harmony. Consumers feel: calm, relaxed, trusting and hopeful. In business green demonstrates growth, visibility, renewal, restoration, self-reliance, reliability, dependability, nature lovers and family orientated; practical and down to earth; generous, kind and loyal, compassionate, adaptable and flexible. Also consider these negative meanings: possessive, materialistic, indifferent, overcautious, envious, selfish, greedy, devious with money; inconsiderate and a do-gooder. Black suggests authority, power and control. Consumers feel: bold, serious and luxurious. It conveys protection, comfort, sophistication, formality, seduction, mystery, endings and beginnings. Negative meanings include being depressive, withholding, conservative, serious, sad and, well, negative. Black is beneficial for businesses selling luxury or supplication. Black packaging can make an item appear more expensive or have a higher price point. It creates a classy and formal impression. Of course, there are exceptions to every rule. As with everything, these associations are not absolute ‘do-or-die’ rules, but they are definitely worth keeping in mind during your business life. Before I let you go, I’m going to give you a few things to think about when choosing colour for your brand identity — food for thought if you will! The first, what if your business functions on a global scale or speaks to a culturally diverse population? I would recommend you think about cultural similarities to draw customers in, or differences that may hurt reputation or sales. The second thing I would suggest you consider is being accessible. I would recommend that you consider colour blindness and or other visual impairments. Never assume your customers see a colour like you do: one in twelve suffer from colour blindness. The third is to consider the final output or purpose of the graphic or document. Perhaps it will be more cost efficient to print in black and white or in grey scale such as for a newspaper ad. It is also possible the final will not see a printed format, conceivably the final could be a multi-media presentation where reds, blues and greens are known to oversaturate. Then there’s always the probability of it going to press one day, where the specific colour or tone does not separate properly into cyan, magenta, yellow and black (CMYK) therefore the Pantone Matching System (PMS) colours need to be used, resulting in higher printing price tag. In the end, working with a professional, experienced graphic designer can help create colourful promotional designs and documents that are powerful, balanced, compatible, clear and concrete to your audience.